Tungsten carbides are used extensively in both weld overlay and thermal spray hardfacing applications such as drilling tools, ripper teeth, ditchdigger teeth, plowshares, valve seats, and mining extraction equipment. They’re extremely important for severe abrasion/ wear resistance and cutting applications. Tungsten carbides makes up nearly 60% of tungsten consumption in engineering practice. Tungsten carbide was first sythesized by a French chemist in 1890. There are two types of tungsten carbide: WC, which directly decomposes at 2800°C [5070°F], and W2C, which melts at 2750°C [4980°F]. Later in 1923, the use of powder metallurgy techniques results in a classic and basic cemented carbide WC-Co, which is tungsten carbide (WC) with a cobalt binder. There are two methods by which tungsten carbide powders are produced from the tungsten-bearing ores. Traditionally, tungsten ore is chemically processed to ammonium paratungstate and tungsten oxides. These compounds are then hydrogen-reduced to tungsten metal powder. The fine tungsten powders are blended with carbon and heated in a hydrogen atmosphere between 1400 and 1500 °C (2500 and 2700 °F) to produce tungsten carbide particles with sizes varying from 0.5 to 30 μm. Each particle is composed of numerous tungsten carbide crystals. 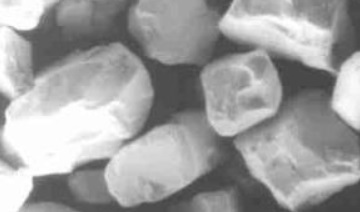 Small amounts of vanadium, chromium, or tantalum are sometimes added to tungsten and carbon powders before carburization to produce very fine (<1 μm) WC powders. Single crystal tungsten carbide microstructure photo by SEM. In a more advanced process, tungsten carbide is produced in the form of single crystals through the direct reduction of tungsten ore (sheelite). The ore is mixed with iron oxide, aluminum, carbon, and calcium carbide. A high-temperature exothermic reaction (2Al + 3FeO « Al2O3 + 3Fe) at about 2500 °C (4500 °F) produces a molten mass that, when cooled, consists of tungsten carbide crystals dispersed in iron, and a slag containing impurities. The crystalline WC is then chemically separated from the iron matrix. *All values are in % unit. *Data in accordance with AWS A5.13(surfacing electrodes for SMAW) and AWS A5.21(bare electrodes and rods for surfacing). *X designates the type of tungsten carbide granules; X=1 for WC1, X=2 for WC2, X=3 for a blend of WC1 and WC2 granules. *The mesh size of the tungsten carbide granules may vary from the specification above, provided that no more than 5% of the granules are retained on the “thru” sieve, and that no more than 20% passes the “on” sieve. 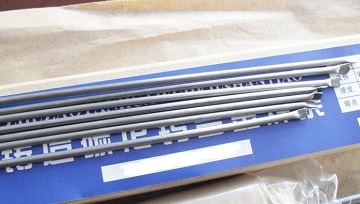 Generally, flux-cored tubular tungsten carbide electrodes are applied for hardfacing overlay, in which tungsten carbide granules and flux are tightly packed in a carbon steel tube (sheath). Heat input of welding process melts the carbon steel and forms a softer matrix to which tungsten carbide particles can be transferred. If the mesh size of tungsten carbide particle is smaller than the abrading particles, then after a running-in period (during which the softer matrix at the surface is worn down), the abrading particles ride over the hard WC microstructural outcrops. Flux cored tubular tungsten carbide electrodes for weld overlay hardfacing. The performance of tungsten carbide hardfacing is primarily by three factors: tungsten carbide volume fraction, size relationship between the WC particles and the abrasive medium, and welding technique applied. Generally, the welding temperature or heat input shall be carefully controlled since if it is too high, the melted tungsten carbide particles may mix with iron and form much softer iron-tungsten carbides, thus reducing the abrasion resistance. Usually, the low heat-input oxyacetylene welding is applied for tungsten carbide weld overlay.